Our scope of prosthetic services includes all types of upper and lower extremity prosthetics. Because each individual is unique regarding level of amputation, function, durability, comfort and appearance, our prosthetic staff fits and fabricates a complete variety of both upper and lower extremity prostheses. Our clinicians are experienced in creating prosthetic devices that range from a partial hand or foot, to those requiring prostheses as a result of total shoulder or hip disarticulation, as well as upper and lower extremity bi-lateral amputations. 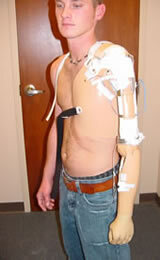 Our expertise extends to pediatric, adult and geriatric prosthetics. Restoring mobility and providing the most extensive selection of new technologies, extends to making available myo-electric and micro-processor components for upper and lower extremity patients, when appropriate. Your physician, prosthetist, and therapist—along with your family members—comprise the support team that helps and guides you to progress and develop your skill at manipulating your prosthesis more easily, whether you choose a microprocessor design or a more basic functional design depending on your lifestyle and needs. Technology changes rapidly, so we advise any amputee who has been wearing their prosthesis for several years to ask your prosthetist to update you on the latest design improvements, and discuss possible upgrades that may make a world of difference in expanding your functional capabilities. It is our recommendation that prosthesis wearers schedule bi-annual appointments to be evaluated and updated on the status of their prosthesis. 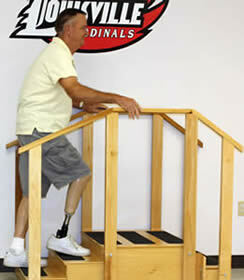 2012 Shaw's Prosthetics Plus, INc. All Rights Reserved.